Last time all eight sets of feet were together in the Polynesian Islands! Colton makes it hard not to miss him! Goodbye Colton and Goodbye Amara! After fifteen days of wonderful blissful days on my sisters boat the Amara, it was time to say goodbye. It also happened to be the same time that Colton had to fly home to San Antonio to attend football camp, so it was bon jour to him as well. We dropped Colton off at the docks in Vaitape and I said a silent prayer that he could make his way over to the Bora Bora airstrip, and then catch his flight to Tahiti. Then from Tahiti he could make it through customs, and on his way to LAX, through immigration and customs, change terminals, and finally find his way to his final flight to San Antonio. Apparently Trent had more faith than I did because he knew Colton could do it with all of his past flying experience. I made him write his flight numbers on his hand and just about stapled his passport to his forehead, but Trent was right, and Colton made it home. Ran into the missionaries on the beach! After Colton’s departure we spent one last night on the Amara and packed our bags and decided to check into the Hilton. Our decision was made simply because we wanted the amenities offered from the resort. Don’t get me wrong…. we love love loved the Amara and my sister and her husbands generosity, but getting our legs on firm ground, the kids to a pool with poolside snacks, and a place that offered pedis and manis sounded awfully nice. Bailey was easily tempted by the simple crazy word…. Wifi. Crazy how that can lure teenagers so easily! 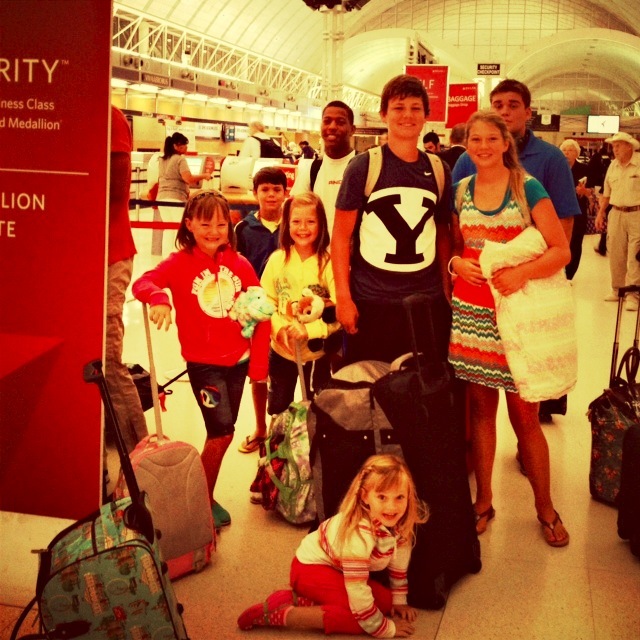 So before our next adventure “Swiss Family Robison” style began, we decided to spend two days at the Hilton to gear up. The Hilton on Bora Bora is beautiful. Since Bora Bora is the number one Honeymooner destination in the world every table here is set for two. As you can imagine getting a table for seven is a little bit disruptive. The accommodations at Hilton Bora Bora. Our room had three bedrooms and two bathrooms. It felt good to spread out a little after our close quarters on the Amara. Bailey was permanently seated at the beach bar where Wifi was free! The Hilton is set on the island of To’opua just off the main island. The only grumble to this wonderful oasis is that it doesn’t have a great view of Bora Bora since it sits on the far side of To’opua island. Otherwise it is a beautiful facility with motus that sit over the water, a pristine lagoon, a small store for amenities, a pool bar, health and fitness center, restaurant, activities center, and a spa that gives the most astonishing views I’ve seen of Bora Bora and the surrounding areas since I’ve arrived two weeks ago. It is a beautiful location and easy to see why honeymooners come her to get lost in each others eyes! It has been lots of fun to be here with so many couples from all over the world. We are definitely the main attraction at dinner since most are all sitting at tables for two and have long since talked about anything and everything they can think of. Our crazy group even minus Colton causes such a stir that they can’t help but look over and be grateful they aren’t us or at least picture themselves at least with two or three of our kids in a few years. Of course Trent and I look at all of their blissful faces giving each other pecks on the the cheeks, and looks of encouragement, and want to ask if any of them want to pretend they are parents for the evening and take a few kids for dinner? We aren’t distracting are we? Of course Bella’s favorite at the all-you-can-eat buffet was the desserts! The Spa here is one thing I can’t forget to mention. The first thing Trent and I did was book time at Hina Spa for a couples massage. After so much time with the kids we were ready to leave Bailey in charge and get in for a little time together. I’m not sure what my therapists name was, and I know he didn’t know my name either, but that didn’t matter because I love any therapist that asks “that feel good lady?” “How is that lady?” that’s about all the talk I need during my eighty minutes of bliss. Trent is seen here waiting for our appointments to begin! My deep tissue massage was done by a local man who didn’t speak much English but his hands worked wonders on my sore neck that was throbbing from all the jarring rides on the dinghy. The view up in the tree top areas of the spa gave a picturesque view of the ocean and the sunset, if only I could have kept my eyes open to enjoy the sun as it set. However, I was too enthralled in the pure splendor of how Bora Bora was now making me feel. So far I had enjoyed the sights, sound, smells, and tastes, of this beautiful island and now I was enjoying the feel… and ohh it felt sooooo good! Move over honeymooners…. our little tribe is here to enjoy all the Hilton has to offer! Waiting at the dock while dad gets us all checked in!